The global magazine for injection moulders, mould makers and product designers. 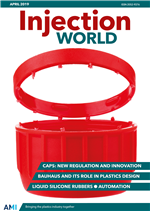 Published monthly, it covers developments in: injection moulding machines; ancillaries; tooling; software; polymers; additives; and key end-use markets. Injection World is a digital magazine from Applied Market Information that is specifically written for injection moulding companies, product designers and mould makers. It covers the latest injection moulding machinery, materials handling equipment, robots and mould technology as well as innovations in engineering and commodity plastics.